Hello from the unseasonably warm Athens, the city where for the next 6 months I will be sniffing, slurping and spitting fermented grape juice and other noble spirits. It's been a pretty busy couple of weeks, travelling from Zagreb to Madrid, back to Zagreb, then to Belgrade and finally reaching Athens on the worst week possible, for someone who's been away from this behemoth of a city for years! The media call it "Black Week", "the Mother of all Strikes" since everybody is on strike, protesting against the government's "newest collection" of austerity measures. This blog has many sides and interests; talking about politics is not one of them. So I will spare you the political analysis of the government's decisions and their effect on the social structure of the Greek society mambo jumbo and instead I will talk about MY thoughts and experiences of the past two weeks. 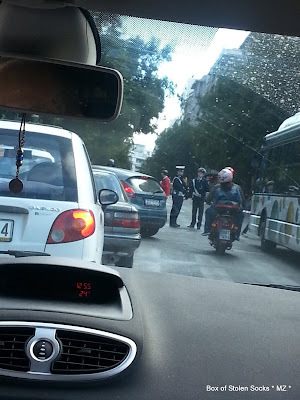 I did get a small taste of the "Athens-jungle, pre-demonstration traffic-jam" yesterday which was more than enough to make me decide to abandon any attempt to go to the centre of Athens and stay put at the leafy suburb of Psychiko, where my new humble adobe is located. 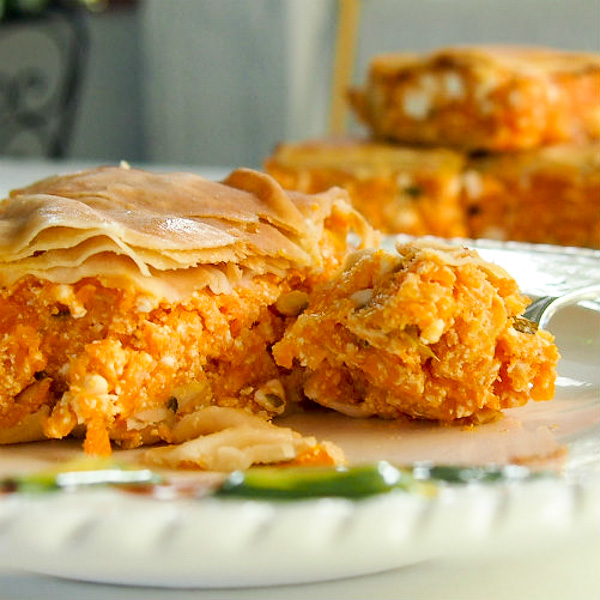 Having said all these, I am now ready to move on to today's recipe of a very Greek version of savoury pumpkin pie, which I did not make but I surely ate and enjoyed, especially after being on the road for a total of 7 1/2 hours . We arrive home and up there on the stove stood the most scrumptious pumpkin pie I have ever seen in my life! 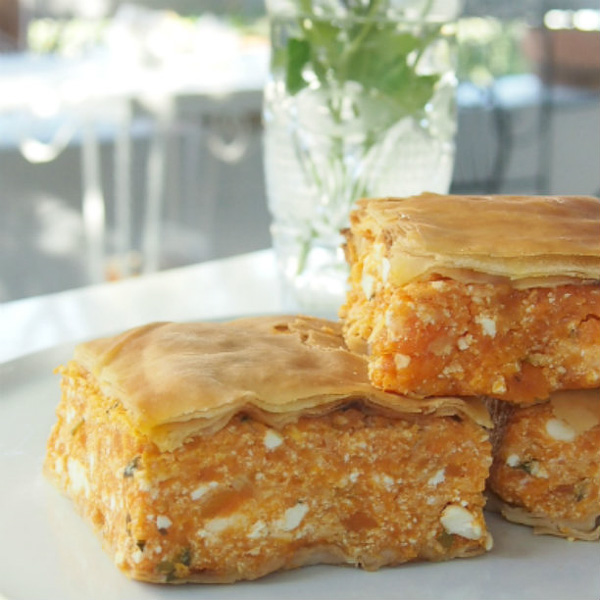 Orange with specks of white feta cheese covered with crispy pastry. I was transfixed!!! I had to fight the urge to ignore everything and everyone and shove a fork into that baby ASAP. But I am girl with manners and I waited patiently, stealing glances at the beckoning pie, until the whole family gathered around the table for a pretty late dinner celebrating our arrival. The pumpkin, sacrificed to make this masterpiece had travelled almost the same distance as we. It came from the vegetable garden of Vasilka's father in the Bulgarian village of Shtit (Vasilka has been the housekeeper for years and she is practically part of the family). The pie was inspired and prepared by my mother in law, who is an amazing woman with a natural talent for cooking (among other things) and a huge repertoire of delicious sweet and savoury recipes, many of which I will be sharing with you in due time!!! Even though this pie contains gluten from the fillo pastry, it is completely egg-free and is very low on lactose (cheese made from sheep and goat milk has a lot less lactose than cow's cheese). It combines the sweetness of the pumpkin with the saltiness and spiciness of both types of cheese and the spearmint, it might sound strange but this is the special ingredient that makes this simple pumpkin pie into an extraordinary, culinary masterpiece! Clean and de-seed a pumpkin large enough to yield about 1.5 kg of flesh. Boil the flesh in as much water as it takes to just cover it, for as long as it takes so that a fork can easily separate the flesh and then strain it in a colander or cheesecloth for at least 6 hours. It is it better to do the straining overnight to save time during the day. In a large pot, heat the olive oil and sauté the spring onions for 3 - 4 minutes. Add the strained pumpkin flesh and stir well. Add the cheeses and mint, remove from heat and stir. Brush a non-stick baking pan with olive oil, lay the first fillo and brush it with olive oil, then lay the second, brush this one as well and finally lay the third. Pour the pumpkin - cheese mixture onto the fillo and smooth it evenly. Place a fillo sheet on top, brush it with olive oil, and repeat with the remaining two sheets. Sprinkle the last one with a little bit of water and drizzle with olive oil. I suggest that you cut the pie in pieces before you put it in the oven - this will make it easier to serve once baked. Bake this marvellous pumpkin pie for 45 minutes until the pastry becomes crispy and golden. I suggest that you share it with other people but, really, I will understand if you want to eat it all by yourself. Vasilka told me that, back when she was a small girl, living in her village, her father had too many pumpkins and those they couldn't use, gave to their donkey as a treat - lucky, lucky donkey 'cause this was the sweetest pumpkin I had in years! Καθαρίζουμε μια κολοκύθα που θα μας δώσει περίπου 1.5 κιλό σάρκας. Τη βάζουμε σε κατσαρόλα και την καλύπτουμε με νερό. Βράζουμε μέχρι να μαλακώσει η σάλκα και να χωρίζεται εύκολα με ένα πιρούνι. Την βάζουμε σε ένα τουλπάνι και τη στραγγίζουμε καλά για τουλάχιστον 6 ώρες. Ζεσταίνουμε το ελαιόλαδο σε μια φαρδιά κατσαρόλα και σοτάρουμε τα κρεμμύδια για 3 - 4 λεπτά. Προσθέτουμε την στραγγισμένη κολοκύθα και ανακατεύουμε καλά. Αποσύρουμε από τη φωτιά, προσθέτουμε τα τυριά και τη μέντα και αφήνουμε τη γέμιση να κρυώσει. Αλείφουμε ένα ταψί με ελαιόλαδο. Απλώνουμε ένα φύλλο κρούστας και το αλείφουμε μς ελαιόλαδο. Επαναλαμβάνουμε με άλλα δύο φύλλα. Απλώνουμε την γέμιση πάνω στα φύλλα, γυρνάμε προς τα μέσα τυχών φύλλα που περισσεύουν αλείφοντας τα και αυτά με ελαιόλαδο. Απλώνουμε ένα φύλλο πάνω από τη γέμιση το αλείφουμε με ελαιόλαδο και επαναλαμβάνουμε με τα υπόλοιπα δύο. Ραντίζουμε με νερό. Κόβουμε την πίτα σε κομμάτια. Ψήνουμε την πίτα για 45 λεπτά μέχρι να γίνει χρυσή και τραγανή. Now this sounds like an interesting combination of flavors for a pie. oh you lucky thing!! this looks lovely.. it looks like a pumpkin version of the spanakopita!! some of my close friends wfrom university were greeks.. i look forward to your posts from there!! Yum! I love the look of this pie and have bookmarked the recipe to try. Wow, the combo of the ingredients sounds do amazing! Oh my…this looks fabulous! I am going to give this one a try…yum!